This is an Anzac-class frigate of the Royal Australian Navy (RAN) referred as HMAS Parramatta (FFH 154). In total, ten warships of this class were built for the RAN and Royal New Zealand Navy (RNZN) based on the MEKO 200 design. 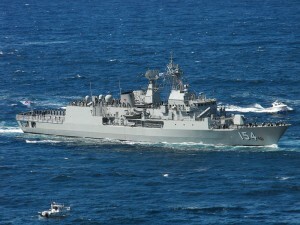 The FFG-154 Parramatta was laid down in 1999, launched in 2003, and commissioned into the RAN in 2003. During her long career, the frigate has been deployed to the Middle East on several occasions. From early 2015, Parramatta is undergoing upgrades including the Anti-Ship Missile Defence (ASMD) system. Australian frigate Parramatta entering Sydney Harbour. Author Credit: Saberwyn. 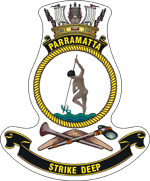 In 2005, Parramatta was sent for six months service in the Persian Gulf as part of Operation Catalyst, returning to Sydney on 13 April 2006.Parramatta was awarded the Meritorious Unit Citation in 2007 for her efforts and conduct during this deployment. In December 2011, while deployed to the Middle East, Parramatta provided fuel and food to an Iranian dhow that was adrift off Yemen. In October 2013 participated in the International Fleet Review 2013. In November 2014, Parramatta and sister ship Stuart were deployed to shadow a Russian naval force operating in international waters off Australia during the 2014 G-20 Brisbane summit. Parramatta has been selected for several upgrades. She was docked in March 2015 to undergo the Anti-Ship Missile Defence (ASMD) upgrade.The upgrade will include the fitting of CEA Technologies’ CEAFAR and CEAMOUNT phased array radars on new masts, a Vampir NG Infrared Search and Track system, and Sharpeye Navigational Radar Systems, along with improvements to theoperations room equipment and layout. As of September 2015, work on the ASMD upgrade was ongoing.